There was this discussion on one of the foodie groups about the snob value of eating “out of season” waterlogged cauliflowers at astronomical prices. I jump into the fracas, as it is a topic (among thousands of others) I have a lot to say about. “There are various benefits to eating seasonal fruit and vegetables - they taste the best as they have been picked at the right time and not ahead of time to factor in transport times like out of season produce that has to travel for thousands of kilometres and languish in cold storage. Moreover, they aren't treated by thermal/chemical/chilling/pressure/processes to be preserved. Seasonal fruit and vegetables have nutrients that support the body in the particular season. Oranges and mandarins that roll out in winter are full of Vitamin C to fortify the body against infections. Oil based seeds and greens like sarson (mustard greens) provide unction to the parched body. One doesn't need to describe the benefits of cool cucumbers and watermelons in summer. The cost benefits are also a given - it costs less to bring the seasonal produce to market, so the prices aren't hiked up. My rant sets me reminiscing, transporting me some four decades back into the summers of our content. Come summer and Mother would plan her annual pickling pursuits. But the time had to be right and the mango had to be fit. She had to make a lot of preparations while waiting for that period after the first summer rains “valivacha paus”. The pickle would then have a better chance to survive, once the relentless heat dissipated a little, doused by the welcome rains. Until then she had to spread out the red chilies, turmeric rhizomes to desiccate under the watchful glare of the sun. Their transformation into heaps of red and golden yellow powders was a matter of great interest. A veritable artillery of pounding and grinding implements - mortars and pestles, made of wood, stone or iron and of various sizes and shapes - was deployed for the task. Flanking them were sieves and winnows that would aid and abet them. 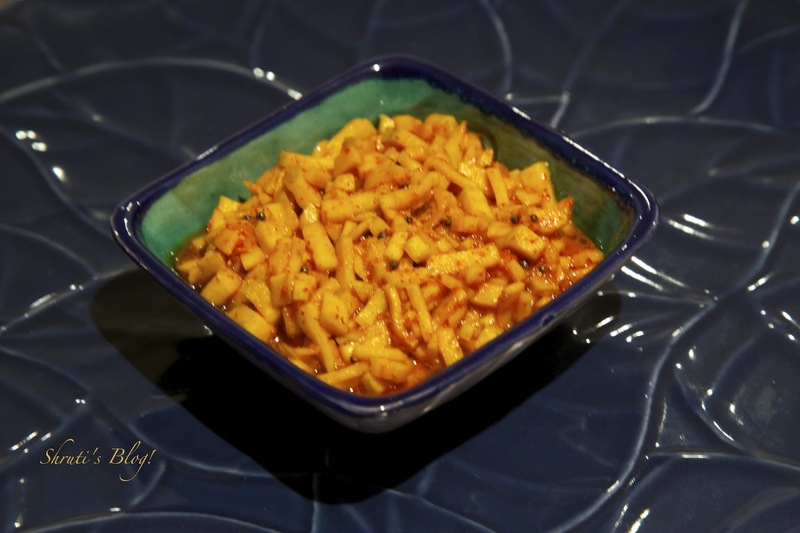 Packaged asafoetida wouldn’t do – as it would be mixed with flour to give it a free flow. So the best and purest nuggets of the resin would be sniffed out from the resident spice specialist. The resin would be sunned to ensure brittleness on its way to be pounded into a pure powder. Millions of mustard seeds would be rolled down a large steel plate, as Mother’s skilled hands would separate the chaff and other impurities from the seed. Golden methi seeds would be diligently picked and left to burnish and bathe in the sun. The sesame oil had to be from the ghani or the press, fresh and fragrant. The salt was to be free of any pollutants that would compromise its powers to pickle. 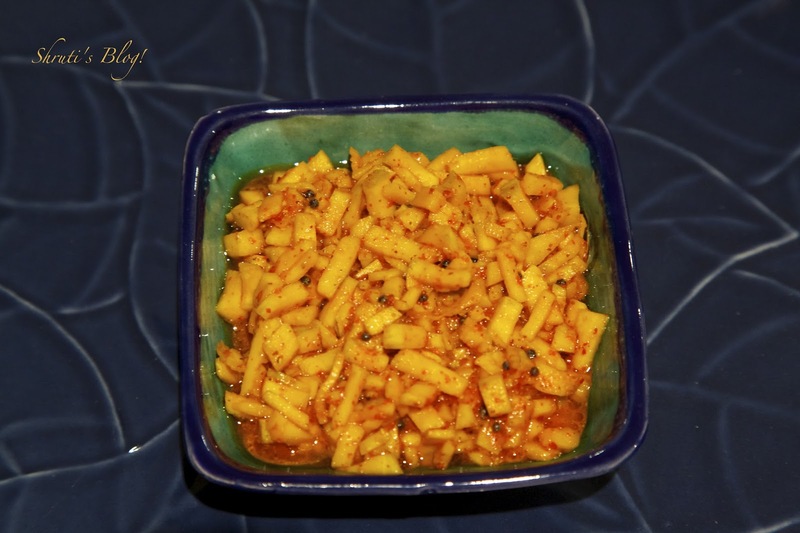 While these preparations were underway and all the pounding and grinding and sifting and panning left the house fragrant with the promise of a year long supply of mouthwatering and lip-smacking condiments, the raw mangoes just wouldn’t stop coming. They were of all types, shapes and sizes. From large totapuris and malgobas to small unnamed denizens. Then there was the odd, occasional “shepya amba” with the inexplicable smell of fennel seeds or the tender coconut kernel like “khobrya amba”. Mother would try them out in various dishes, but mostly in these “temporary” pickles. 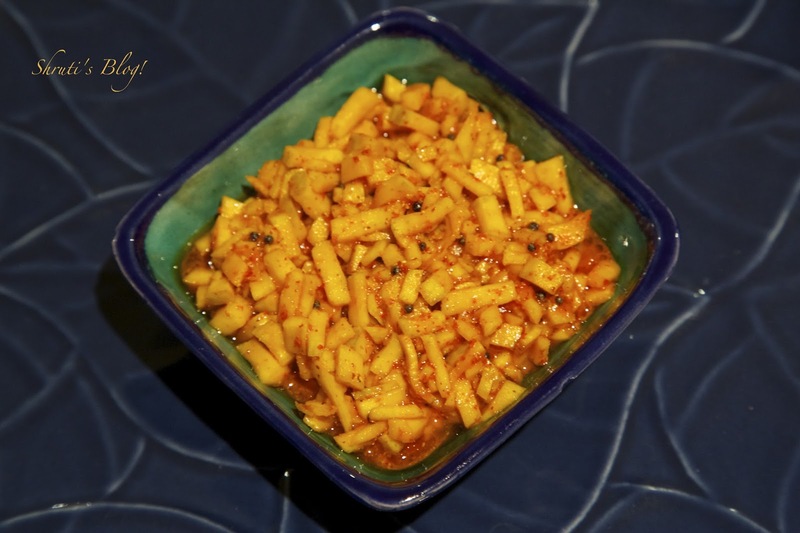 The miniature mango bits, sometimes without the skin to allow instant marinating, and this pickle (more of a relish than a pickle) would be ready to eat instantly. On this chilly mid-winter morning in Melbourne, I guiltily chop a raw mango interning in my fridge for several weeks. I judge it for its lack of firmness. $6 for a kilo of kairi is a preposterous price to pay for something that is best stolen from neighbours’ trees or lopped from the tree in the backyard. But it is the cost of coveting it out of season and in a land that is not its domicile. The mango was best suited to be pickled into a बाहुलीचं लोणचं - in a rough translation it would be a toy or pretend pickle. This name must have come up on lazy afternoons when as we feasted on the dumbed down versions of fresh pickles. The name was even approved by Mother to enter the family dictionary. For years I thought Mother was only humoring us kids hanging around her without the yoke of school and trying to keep us out of her hair as she went about her spice sorties. I realised only today that she was actually auditioning the mangoes in her search for the perfect mango, just that shade of crispness and sourness the choicest best of the season. Wash and dry the kairi. Then peel and chop it into small bits. Add all the powders, salt and sugar. Pour the cooled oil tadka. Mix and serve! Store any remaining loncha in the fridge. This is perfect for my kids who are just begining to become interested in desi food. They can help make it too! It looks really good. If appams come, can eshtu be far behind?